Analog Lab 3 in Ableton 9 ? But "Analog Lab 3.dll" doesn't appear in pluggin Ableton section. So, my Ableton version isn't compatible ? I'm obligated to have Ableton 10 ? Re: Analog Lab 3 in Ableton 9 ? But i do have a 32 bit Live 8 Lite, and the latest Analog Lab can load into that. Are you sure you have the correct settings in Preferences and have installed your plug-in in the correct folder? Hi after installing Al3 make sure you rescan in ableton the vst or AU. Hi LBH, terryn, thanks for your answers. Yes. You say "installed" ? I just move the .dll in the folder. And yes, I have verified that folder are correct, and I rescaned in ableton. When I installed Analog 3, I found the folder in Program files (x86) : "Vst Plugins" and I found "Analog Lab 3.dll" maybe it isn't this file to put in Ableton VST folder ? In fact, when I installed for the first time Analog 3 I didn't pick up the boxes without the mention "64 Bits"
So.. It's good now. Thanks guys! Yes i was just posting about that, but then you had posted while i wrote. Good you found out. 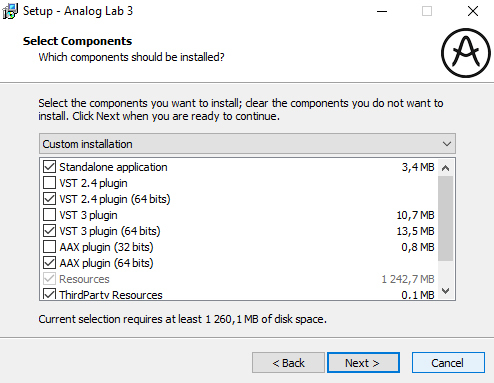 NOTE: Keep in mind that when you run the Analog Lab 3 installer/ program, then you get options to choose where to install the 32 and the 64 bit plug-ins. Allways read things during an install before you click ok. I recommend you install your plug-ins directly to a folder your DAW read. If you don't do this, then you get more work each time you get updates and upgrades of a plug-in, because you have moved the plug-in from the original install path so the updater can't locate it. Please also keep in mind, that you also can use Arturia Software Center (ASC) to install your products and get updates. Thank you very much LBH !